The Chennakeshava Temple in Belur (Kannada: ಶ್ರೀ ಚೆನ್ನಕೇಶವ ದೇವಸ್ಥಾನ) originally called Vijayanarayana Temple (Kannada: ವಿಜಯನಾರಾಯಣ ದೇವಸ್ಥಾನ), it was located in belur, it was built on the banks of the Yagachi River in Belur, by the Hoysala King Vishnuvardhana. 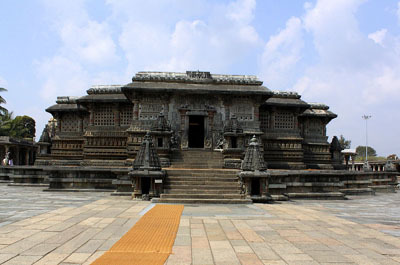 Belur, which was an early Hoysala capital, is in the Hassan district of Karnataka state, India. It is 40 km from Hassan city and 220 km from Bangalore. Chennakesava (lit, "handsome Kesava") is a form of the Hindu god Vishnu. 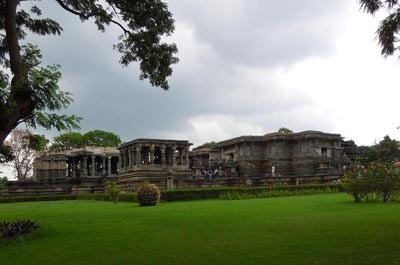 Belur is well known for its marvelous temples built during the rule of the Hoysala dynasty, making it and nearby Halebidu favored tourist destinations in Karnataka state. These temple complexes have been proposed to be listed under UNESCO World Heritage Sites. ​Hoysaleswara temple (Kannada: ಹೊಯ್ಸಳೇಶ್ವರ ದೇವಸ್ಥಾನ) (also spelt "Hoysaleshwara" or Hoysaleshvara") is a temple dedicated to the Hindu god Shiva. It was built in Halebeedu (in modern Karnataka state, India) during the rule of King Vishnuvardhana of the Hoysala Empire in the 12th century. The construction was started around 1120 CE and completed in 1150 CE. During the early 14th century, Halebidu was sacked and looted by Muslim invaders from northern India and the temple fell into a state of ruin and neglect. Previously known as Dorasamudra or Dwarasamudra, Halebidu is 16 km from Belur, 31 km from Hassan and 149 km from Mysore, in the state of Karnataka, India. Shettihalli Church is located 22 km from Shettihalli and 20 kms from Hassan, in Karnataka. Built in the 1860s by the French missionaries in India, the church is a magnificent structure of Gothic Architecture. After the construction of the Hemavati Dam and Reservoir in 1960 the church was abandoned. 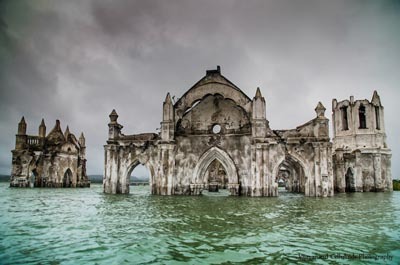 It has since then become a famous tourist spot where people flock to see the half submerged church during monsoon. The Hasanamba temple in Hassan district of Karnataka makes for an interesting story of miracles. Do you need to believe in all of them to understand Indian culture? Perhaps not. But it sure adds to the flavours of India. Adding to the ever-lasting list of her miracles, Hasanamba gives audience to her devotees only once an year. Depending on the Hindu Calendar, the duration varies each year. The temple only opens on the following Thursday of the full moon day in the month of Ashwija (usually late Oct - early Nov). The temple closes on the day of Balipadyami when the rest of Karnataka is celebrating Deepavali. from hassan its 2 kms to Yogakshema Ayurveda. The founder of the Yoga Kshema Ayurveda Center, Dr. Heggade is a visionary and philanthropist who is the unbounded power behind the luminous temple town of Dharmasthala. 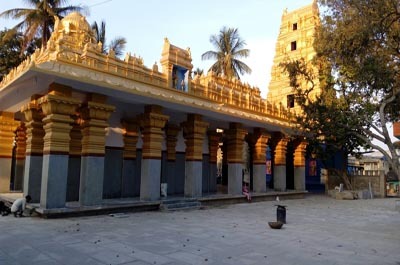 For over 45 year, Dr. Heggade has transformed the role and importance of temples. He believes that temples should be pillars of strength that not only offer solace but also service to society.Keeping to his unyielding belief of service and betterment, over the years Dr.Heggade has changed the landscape of Dharmasthala with his various educational and medical institutions and the many trusts and philanthropic initiatives he leads. 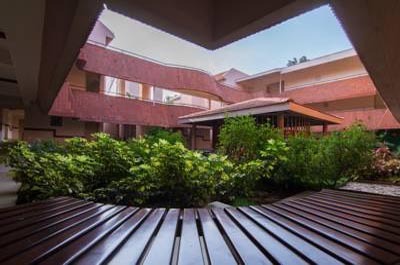 With the Yoga Kshema Ayurveda Center, Dr.Heggade displays his unique stance that is thoroughly modern, yet ingrained in ancient cultures and sciences.